For fans of the second-hand, nothing could be more off-putting than sprawling air-conditioned malls. This breed of shopper prefers rooting around in bins of assorted knick-knacks in vintage stores, flea markets and warehouses looking for bargains on second-hand items. There is an array of places in Singapore for packrats and rummagers. On offer: everything from vintage items so obsolete that even the gadgets that replaced them became obsolete, as well as oddball items many would struggle to find a use for. The Sunday Times visits some vintage stores and a warehouse full of repossessed or discarded items to try and pick out some hidden gems. "Nothing is impossible," says Mr Harry Ang, 76. He is talking about repairing even the most worn-out gramophones. These are the earliest music players, powered by a hand-cranked mechanism and topped with a flared horn. The retired businessman has been collecting them since he was a teen, when people were throwing them out. "Gramophones take us back to the 1800 and early 1900s - they bring back memories and make us feel young again," he says. And they are beautiful decorative items. In his flat, he has about 20 players, their wooden, brass or elaborately painted "morning glory" horns ready to pour out music from the dozens of records and phonograph cylinders he owns. 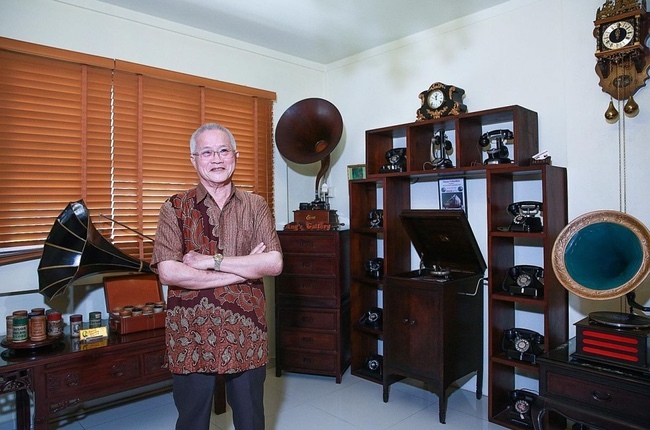 His collection of vintage telephones and gramophones used to number in the thousands. Some years ago, he decided to stop adding to it and also reduce its size. His hobby is now selling off the remainder of his haul, while also repairing units others bring to him. The music players, which he prices from just a few hundred dollars to more than $10,000, are restored in a meticulously organised workshop next to the living room. People find Grandmaphone in online classifieds, then get in touch by online chat or text message to arrange a viewing at his flat in Jurong West. He gets a mix of buyers. Some are corporations looking to add a retro touch to lobbies or waiting rooms, while others want to play old records and cylinders. One can find gramophones at flea markets, but Mr Ang says that non-specialists will not be able to offer history and mechanical knowledge of the devices. "A lot of gramophones are like the United Nations - you can find bits and pieces from all over in them," he says. His units are in working condition, with authentic parts, he adds. As for vintage telephones, he began collecting them after he dismantled one and was fascinated by how it worked. He has models from around the world and all of them work, though some might need a circuit conversion to make them compatible with the Singapore system. They go from under $100 to a few thousand dollars and a few feature metal or wooden bodies. There is one procedure he is a stickler about: interior cleaning. Old handsets carry traces of owners from decades past. "I clean and disinfect every telephone I have," he says. Info: Text Mr Ang on 9739-7878. From refrigerators to copiers, fax machines to cell culture incubators, slide projectors to viscometers - Asia Asset Recovery is a cornucopia of items from hospitals, laboratories and offices. It is not clear where the stuff filling this showroom-warehouse in a flatted factory in Bukit Batok comes from - the staff members and owner did not want to comment - but based on information about the company online, Asia Asset Recovery most likely gets its products from scrap dealers and assets seized from bankrupt companies. Anyone can go there and browse its shelves, groaning with oddly-shaped glassware from chemistry workshops and instruments from dentists' offices. And yes, there is a dentist's chair for sale at $1,000, but the price is negotiable. Buyers might pair the chair with several of the sharp and pointy dental instruments also on offer. One can see how someone who might be making a movie set in the 1990s might come here to get, say, an old-school Blackberry or Ericsson mobile phone (around $30 each) or an old-fashioned CRT (cathode ray tube) television set (also around $30). Before anyone thinks that this is a more refined version of the Sungei Road Thieves Market, this company does not, for example, sell old clothes, shoes or scrap material. It deals in furniture, computer gear and equipment from industrial, engineering and medical laboratories. The products are free from grime and unmarred and one can test whether they work at the counter, but the store offers no guarantees. This reporter paid $100 for an ultrasonic cleaner, used to clean small items and, while it seemed to work in the showroom, it was dead when taken home, probably as a result of being lugged around on the MRT. So buyers beware. Still, whether you are a film-maker or mad scientist, or looking to use a cool old-fashioned switch on your electronics project instead of a sleek new one, this place offers an interesting alternative shopping experience. Mr Jason Chong's flat in Marine Drive serves as his home office. He does most of his marketing on Facebook. Potential buyers will text to set up a viewing appointment. They come to see the dozen or so units on his shelves, beauties from the 1800s to machines from just a few decades ago. His is, as far as he knows, Singapore's only manual typewriter sales and repair service. Enthusiasts still buy typewriters because they are a tactile pleasure - press a key and gears, springs and levers respond with movement and noises. Many also buy them for their decorative value. Mr Chong, 40, knows this. That is why his shelves look like a museum exhibit. Here are units from brands like Smith Corona, Royal, Olympia, Underwood and Remington, shipped in from the United States and Europe. And even if buyers just want something to put in a display case, Mr Chong, who learnt his craft from an uncle who worked at the now-shuttered Olivetti factory in Singapore, ensures they are in good working order. He shows buyers how to set up, maintain and use them. And though much of his flat is filled with the machines, typewriters are his passion and hobby, he says, while refusing to reveal details about his main job. "People have the misconception that you can just buy something that is 30 years old and put a ribbon into it and it will work," he says. It might make marks on paper, but old machines might have worn-out springs and rotted rubber parts. So the height of letters will be askew. Margin stops - set up to type inside a thank-you card, or within an A4 sheet - will drift. Junior college and university students buy typewriters, he says, for distraction-free writing. "They want to do a digital detox." New buyers might start with a more recent, lighter model that costs around $200, but those who have caught the bug go for older models that sell from around $400 and up. The older sets are heavier because they contain more metal and fewer plastics, but they are workhorses. The older units also carry the patina of age, a reminder of writers who spent hours on the machine, perhaps years before the current Singapore user was born. "We don't spray it or paint it. We keep them original," Mr Chong says.